Duo GB Ltd supply and install modular exhibition flooring systems which are for sale, hire or rental. 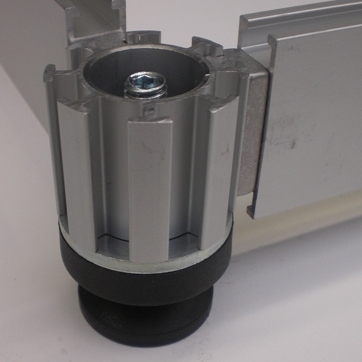 These systems are constructed from Aluminium with wooden panels, all have height adjustable feet. Easily transportable and can be assembled with a minimum of tools. Ramps for disabled access and special panels for electrical outlets can also be added. 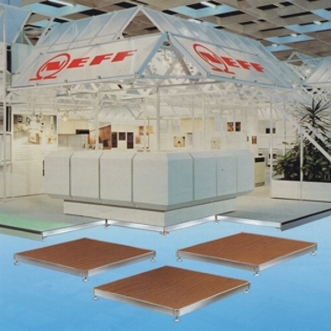 These modular exhibition flooring systems require carpet and edging to be added after flooring is laid and levelled. All floors are perfect for defining exhibition stand areas, whether space only or within a shell scheme. Suitable for all interior exhibition stands, trade show booths, office areas and retail spaces. Duo GB Ltd sell, hire, install & dismantle modular exhibition flooring systems on a global scale, for details ring the number below. Duo GB Ltd have their own design and graphics department, specialising in exhibition stand design, large format digital printing, exhibition graphics, banners and pop ups. All exhibition stands from Duo GB Ltd can incorporate custom designed graphics developed in-house at our Midlands based office. Using a variety of applications such as lightboxes, stretch fabric ceilings, drop papers and printed/vinyl graphics can greatly enhance an exhibition stand or interior display.